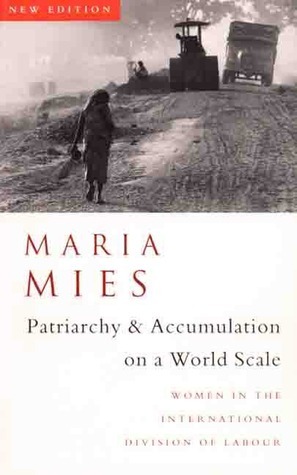 Maria Mies is a Marxist feminist scholar who is renowned for her theory of capitalist-patriarchy, which recognizes third world women and difference. She is a Professor of Sociology at Fachhochschule in Cologne, Germany, but retired from teaching in 1993. Since the late 1960s she has been involved with feminist activism. In 1979, at the Institute of Social Studies in The Hague, she founded the Women and Development program. Mies has also written books and articles that deal with topics relating to feminism, third world issues, and the environment. In her study of the lace makers Mies argues that that ideological views often coincide with economic systems. 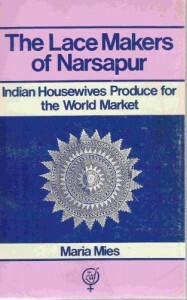 For example, in her study she notes that in Narsapur a status symbol of belonging to a high caste or class is if the women of the family stay in the house (implying that they are not required to bring in capital) and do not go to work in the fields (Mies 1982: 33). Therefore many of the poorer women took up lace making, because it brought with it a higher sense of status. Yet, lace making was not considered as productive work, even though it brought capital into the household, because it was performed in the house and viewed as something women did in their spare time. In this case society is benefiting economically from women’s work, yet due to the ideological views of women’s roles within society it is not viewed as work. Mies notes that policies for alleviating poverty often view poverty as a technological problem (e.g. the Green Revolution), whereas her study of the lace industry suggest that poverty also arises from ideological concepts of women’s work. This is the foundation of Mies’s theory of capitalist-patriarchy. This theory is presented in her book Patriarchy and Accumulation on a World Scale: Women in the International Division of Labor (first published in 1986 and then again in 1998). In this book Mies focuses on third world women, the international division of labor, and the capitalist system from a Marxist perspective. She claims that there is an intrinsic relationship between capitalism and patriarchy and that we can no longer accept a classical Marxist explanation of the capitalist system, because it does not include women. She goes on to propose that capitalism usurps the labor of women through a patriarchal system, which labels it as housework or subsistence work. In turn this “subsistence” work is not accounted for in the cost of labor (i.e. production), which leads to the accumulation of capital. This means that the labor of women is exploited by the system of capitalist-patriarchy, because it is not given credit for the economic benefits that it provides for the system. She goes on to evaluate women’s roles within the International Division of Labor (IDL), which she represents as a sexual division of labor. With the rise of multinational corporations (MNCs) and the global economy, women’s labor has been increasing exploited, for women are viewed as docile, low wage, flexible workers with low visibility and little power. Mies also couples issues of third world women and the theory of capitalist-patriarchy with that of ecofeminism. She wrote a book in 1993, with Vandana Shiva, entitled, Ecofeminism. In the book they argue that women and the environment, of both the North and South, are negatively impacted by capitalist-patriarchy. They propose that in order to protect the environment and women, we must reject the idea of unrestrained economic growth and mass consumerism. Mies, Maria. Indian Women and Patriarchy. Delhi: Concept Publishers, 1980. —. The Lace Makers of Narsapur: Indian Housewives Produce for the World Market. London: Zed Books, 1982. — and Vandana Shiva. Ecofeminism. London: Zed Books/Fernwood Publications, 1993. —. Patriarchy and Accumulation on a World Scale: Women in the International Division of Labor. London: Zed Books Ltd., 1998. — and Sinith Sittirak. The Daughters of Development: Women in a Changing Environment. London: Zed Books Ltd., 1998. — and Veronika Bennholdt-Thomsen. The Subsistence Perspective. London: Zed Books Ltd., 1999. — The Village and The World: My Life, Our Times. North Melbourne: Spinifex Press, 2011. I only came across the term “housewifization” last year, when translating a notable book about Colombian Women by Elena Garces, from English to Spanish. Mies research is fascinating, and very well explained. The relationship between capitalism and Patriarchy is the key. Thank you for posting this article on your scholar blog.